This is a dense woody climbing vine with dark green foliage and large trumpet shaped flowers that are orange. This is a self climbing vine with glossy dark green evergreen leaves. English Ivy prefers shade in our hot sunny climate, and can be used as a ground cover. Vigorous climbing vine. Course green leaves and tan to pink seed clusters. Excellent for quick shade on trellises or dog pens. Dies to the ground in winter. This is an unusual vine with round blue-green leaves. It has pale yellow flowers in early summer, and what really makes it distinct is the large round flower bracts which are heavily glaucous, creating a ghostly effect. This is a fast growing vine which climbs as well as creeps. 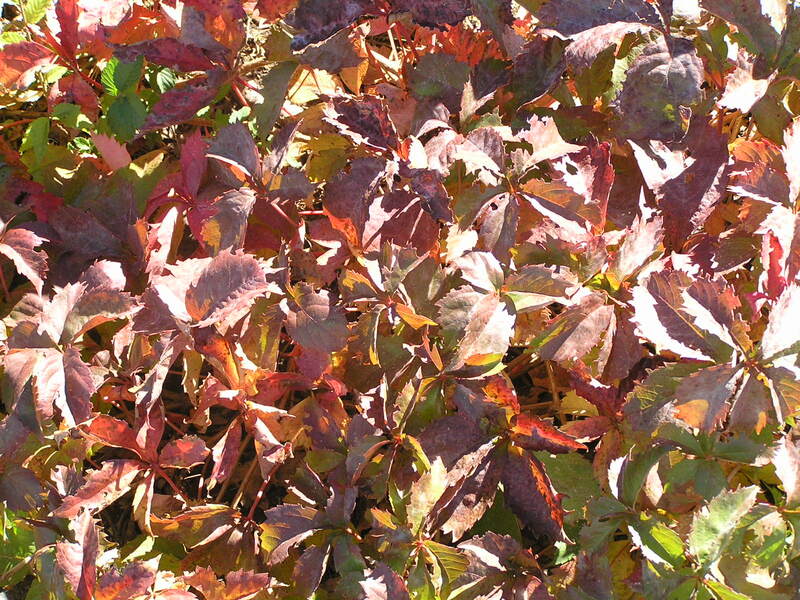 The leaves are palm shape and turn a rich red in fall. It produces small, bluish-black fruit which the birds love.